This first-person narrated tale of a woman on the run is a psychological trip as well as a real one. Although she changes names several times during the book, let’s refer to her a Tanya for the sake of avoiding confusion. Tanya runs from a dead husband in the opening chapter, but that’s only the top of the iceberg as there is more in Tanya’s past that we are allowed to see at first. The trip sees her through a downgrading spiral both in her economic situation and her sanity, and endless changes of hair and cuts. It is also interesting how she gets her new identities in these new age of technology and records. Despite her circumstances, at the core Tanya is a decent person with a conscience and although her actions are on the wrong side of the law, her motives somewhat justifies them, at least most of the times. There is a lot said about the twist at the end that I was anticipating a “Brad Pitt was a figment of your imagination in Fight Club,” but no, the reveal is more grounded in reality than that-thank god! Overall, it is an interesting read, filled with suspense if not action scenes that are only sprinkled throughout the tale. 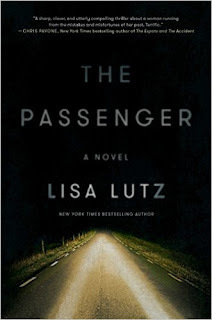 I was lucky to get my hands on an ARC from Lisa Lutz’s new novel The Passenger.